Happy 2019! Wishing you more time to spend on the water with a paddle in your hand! 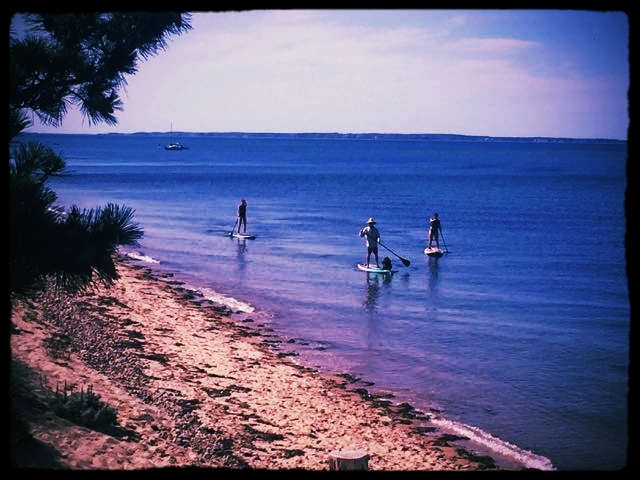 We offer Stand Up Paddle Lessons and Tours far from crowded Vineyard Shores. Our experience and our equipment are second to none. We have a private launch spot in Aquinnah on Dogfish Bar and we have been making big smiles on the water since 2003!!! SUP Surfing and SUP Racing. An avid canoeist from the early age of 5 on Maine rivers and Mount Desert Island waters, Katahdin began paddling and fishing Vineyard waters at the age of 9. Like the Natives that traveled the cape and islands, the canoe was the primary family transport for fishing, clamming, lobstering, and access to remote beaches. It was at the age of 18, while windsurfing off Menemsha, that he broke the mast of his old Mistral. Finding replacement parts proved difficult, so he set out with just a paddle on his windsurf board one day to see if he could find another way to explore. The perspective on the water was absolutely beautiful! He caught waves, fish, and even a few mermaids over the years with that old paddle board. Of course he got himself into trouble a few times too, surfing hurricane swell on a board too heavy and flat to make the drop (but it was still fun). He had no idea that 20 years later Stand Up Paddle would take over the world!!! He started 6K6 SURF AND PADDLE SCHOOL in 2003 and has been spreading the stoke in the island community ever since. First responder first aid certified with more than 12 years as an instructor and 30 years experience paddling island waters.